I like lettuce. I especially like it when it’s cheap and seasonal. Loose heads and bunches of lettuce are a lot cheaper per pound than boxes or bags of lettuce. Heads and bunches of lettuce last a lot longer in the fridge too. A bag of salad might last a week if you’re lucky. More often it will last 2 or 3 days. In a perfect world lettuce would always get eaten before it wilts and turns to slime, but most of us have trouble keeping up with our good intentions. Iceberg lettuce, which is usually the most affordable, will keep for 3 weeks in fridge if you keep it in a sealed zipper bag. Even after cutting part of it away, the remaining portion will keep for at least a week in a sealed zipper bag. If the lettuce isn’t as crisp as you like, add a spoonful of water to the bag and the lettuce will crisp up overnight. Assumably lettuce loses nutritional value while being stored, but it doesn’t wilt and it’s still good to eat. Variety lettuce like romaine or curly leaf will keep for up to 2 weeks if kept in a sealed zipper bag. Once you cut variety lettuce it’s keeping qualities diminish quickly. Better to pick off the leaves as needed and leave the rest of the bunch intact. For times when you must buy Bag O’ Lettuce, be sure to check the sell buy date, and choose a bag with the sell by date at least 4 or 5 days in the future. Lettuce in a plastic box usually will keep longer in the fridge than lettuce in a bag. While on the topic, to keep your bag or box of lettuce fresher longer try this tip. Keep your hands out of the bag or box. Use clean utensils to remove the desired amount of lettuce from the container. Lettuce in a bag can be shaken over your bowl and gravity will dispense it as desired. Your hands have germs on them. Even clean hands have germs. When you put your hands in the bag or box of lettuce you introduce germs into the container which causes the lettuce to deteriorate more quickly. So keep your hands out of the bag and your salad will last longer. For those lean days before payday you may want lettuce, but not have any available. In this case I use what I call Faux Lettuce. 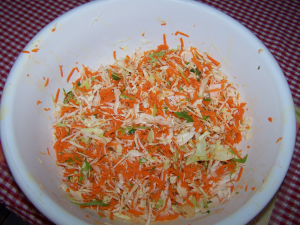 It’s a mixture of shredded cabbage and carrots. 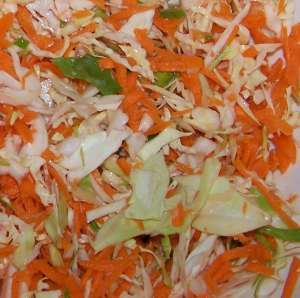 You can use any kind of ratio, like equal parts cabbage and carrots, or 2-parts cabbage and 1-part carrots. If you don’t have carrots, you can just use shredded cabbage, but the combination of cabbage and carrots seems to work better, at least my kids like it better. 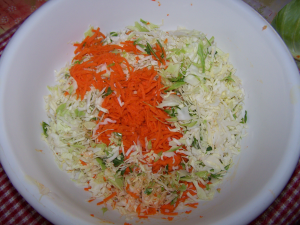 The cabbage and carrots must be finely shredded to make them easy to eat and thus family friendly. 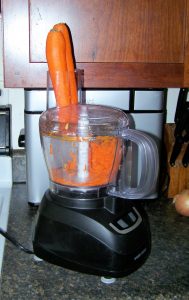 Use a food processor to shred the carrots. Dump them into a bowl. You want 2-1/2 to 3-cups. Switch to the slicing blade. 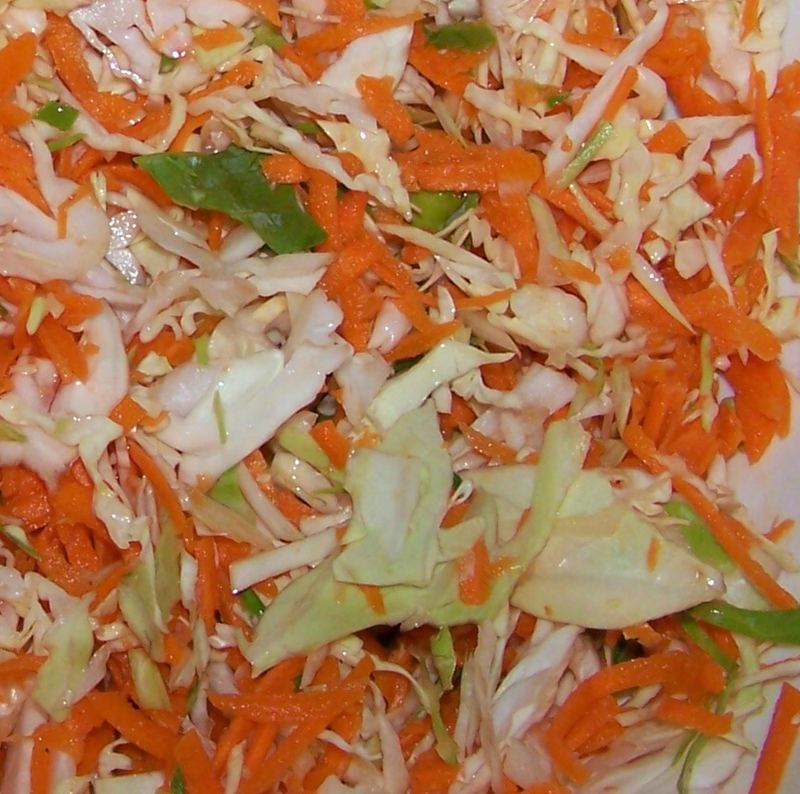 Feed the cabbage into the food processor and slice it into small pieces. You want 2-1/2 to 3-cups of cabbage. Dump the cabbage into the bowl. 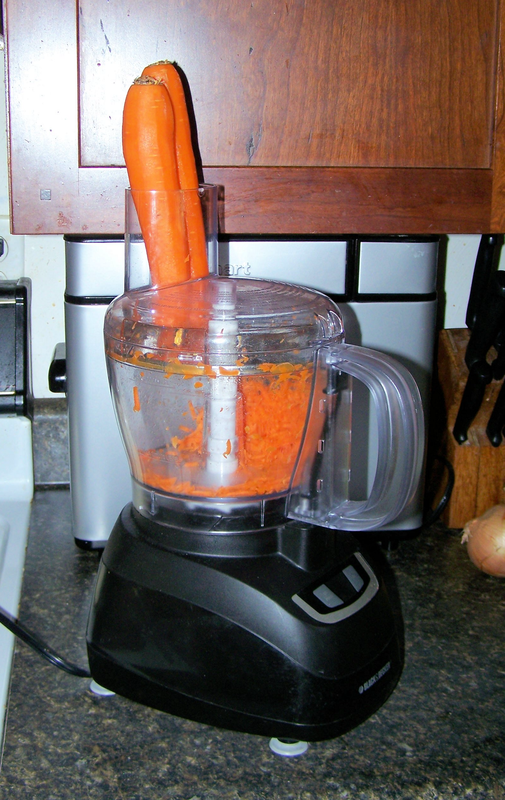 Dismantle and wash the food processor. If you let it sit then it will be the devil to clean. If you wash it now, it should only take a few moments. Sprinkle the lemon juice over the carrots and cabbage. Use clean hands or a large fork to mix all the ingredients together. Makes about 4 cups or 4-servings: 1-cup each. Per Serving: 37 Calories; trace Fat; 1g Protein; 9g Carbohydrate; 3g Dietary Fiber; 0mg Cholesterol; 29mg Sodium. Fat 5%; Carbohydrates 84%; Protein 11%. Use Faux Lettuce anywhere you would use regular lettuce. It’s good on tacos, as a green (and orange) salad with a simple homemade dressing, or on sandwiches. Top it with a ladelful of vegetarian chili and a handful of tortilla chips for a tasty taco salad. I’m not sure what it is about the combination of carrots and cabbage, but they make a very tasty alternative to the more conventional lettuce. 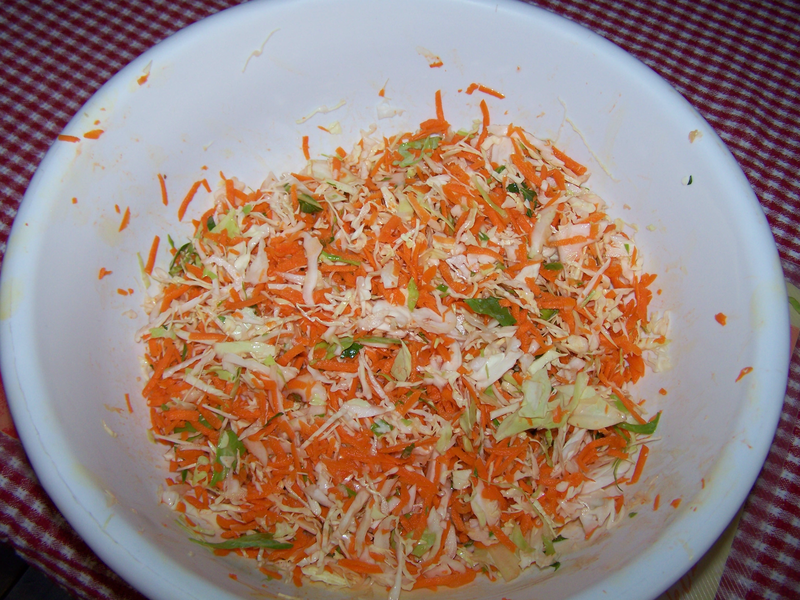 I do know that shredding the carrots and cabbage makes them easier to eat and more user-friendly for the family. I store this in a covered glass dish in the fridge. It keeps for at least a week and sometimes even a couple of days longer. It’s most nutritious directly after preparing, but still plenty good for you a week later. This really brought home to me the way that a simple substitution can save so much cash at the check-out. I was thinking that a half a bunch of parsley would be an inexpensive way to add more nutrition to the mixture and would also make it greener to look at, which has its own aesthetic appeal. Even with the parsley added, it would only cost between $1 and $1.25; still half as much as a bag of the cheapest iceberg salad. How much will your next salad cost?